This is for the cars that are fitted with the self cancelling indicator in the centre of the steering wheel (1934 ~ 38). For example Ruby, Opals, Pearls and the later Nippies (specials). You may find that one side does not cancel, which can be a bit annoying for the car behind as your indicator is left flashing. Then this article may just help and explain why. Now rather than just find a replacement which are now rare and can be expensive, I would see if it can be repaired. Here is a summary of the work carried out, and I hope that this helps. 2. 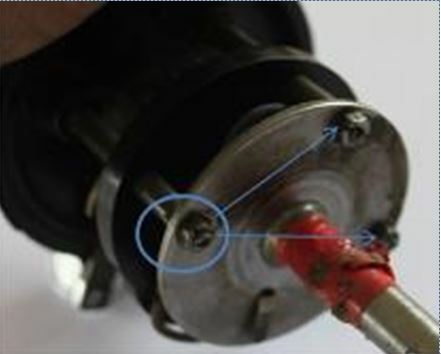 Remove the connections and loosen the clamp at the base of the steering box. 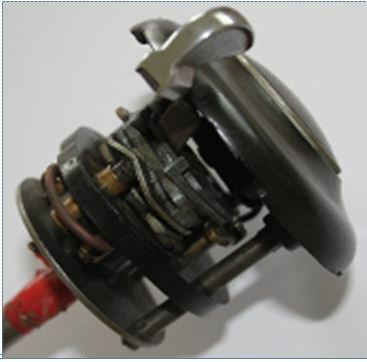 The centre indicator and horn assembly can be pulled out. But take note that you may have to rotate the assembly 180 degrees to clear the small plate on the inner part of the steering wheel and then it should slide out. Due to the length of the assembly be very careful with the roof-lining e tc..
3. With the assembly removed, start to remove the 3 base nuts. 4. This then allows access to the terminal connections at the base of the indicator. Again take a photo and disconnect these. 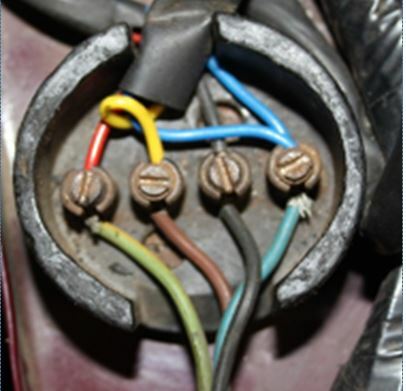 The 3 pillar's are now unscrewed to allow access to remove the horn wire, Note the horn connection may be soldered in, so you may need to cut and make good later. 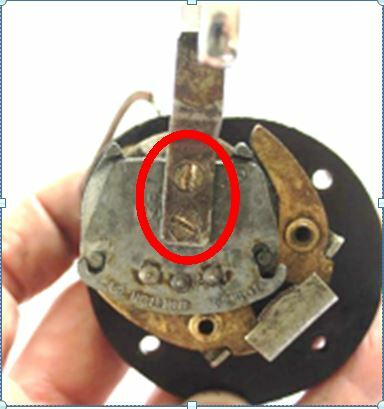 The Indicator arm can be removed, 2 screws. 5. Now a slight pressure on the Indicator TCS34 assembly, will allow the small 'c' clip at the termination block to be exposed, and, with a small pair of circlip pliers, this clip can be extracted. 6. Important - take care that the 2 detent units, and the rollers do not depart to the other end of the garage as these are spring loaded! These parts can be cleaned, lightly greased and left ready for later assembly. On the opposite side there is a larger spring and contactor plate. This is made of several parts, again take care when removing these. Good idea to keep them in order. 7. You now have the die cast assembly, which has the 2 cancel arms. These should have a small spring forcing the leavers out. But you will find only 1 side is working, hence the problem with the self cancel. 8. Remove the two screws retaining the detent steel track from the base of the casing. This exposes 3 pins; the middle one is the spring pivot; the outer ones are the pivot for the cancel arms. Using a small suitable size drill, approx. 3 mm, just drill away the 'flared’ part of just 2 pins. 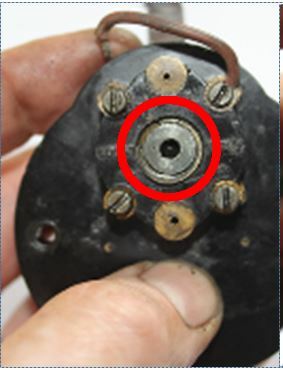 One removed pin must be the middle one, as this allows the spring to be removed. Leave one well alone to keep the rest of the assembly aligned. Now with the use of a panel pin (nail) as a punch and a small hammer extract the 2 pins. This allows you to remove the broken spring and the 1 cancel arm from the assembly. 9. 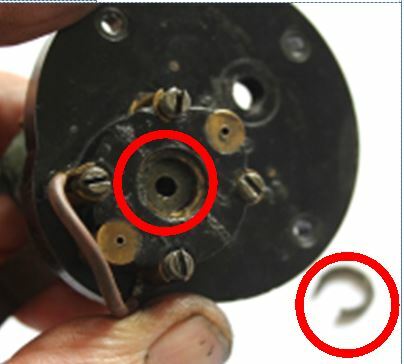 Obtain a suitable small compression spring, straighten the coils out, and reproduce the spring but now with both arms. You can use a 6 BA screw as a former to create a small coil at the middle of the spring for the pivot. It sounds difficult but a small pair of pliers and time you can achieve this, it will be functional, if not totally like the original. Now tap the centre pin hole using a 6 BA tap andhopefully you may be able to reuse one of the pins. 10. Now for reassembly, this is a little fiddly but take your time and you will achieve this task. The TCS34 assembly now has the pins and screw fixed in place. The cancel arms spring out on both sides. 11. Clean the rest of the assembly, ensuring that the spring works and all contacts are clean. 12. Assemble the TCS34 with the large spring and connector plate and fit the 'C' clip. This can be closed again with a small pair of pliers. Ensure that the contactor plate is engaged correctly (See photo) so that when the assembly is turned that it contacts with the contacts on the main plate. 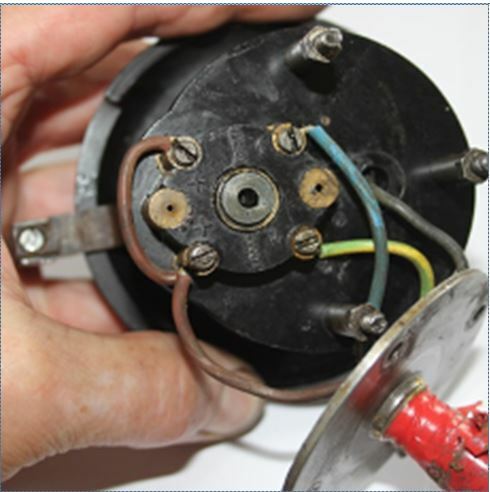 Hopefully you now have a fully working Lucas TCS34 self cancel indicator assembly.